PowerPoint has become a large component of modern life. 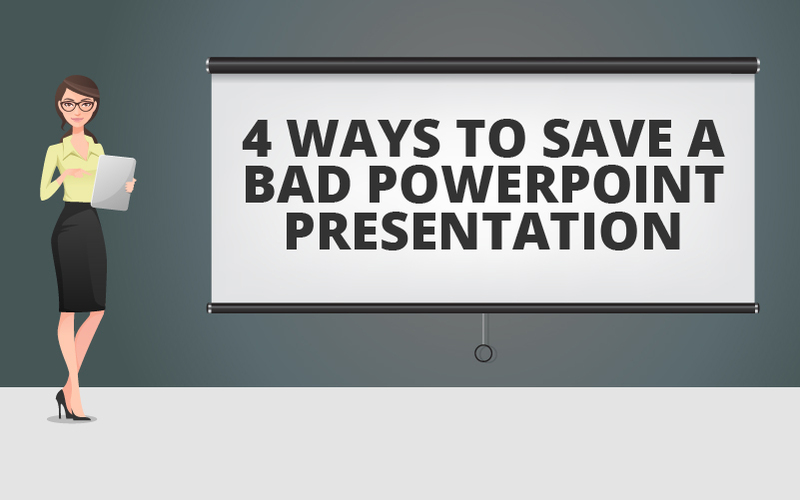 If you’re a grown up, chances are that you’ve witnessed a number of bad PowerPoint presentation experiences and probably created a few in your lifetime. We would like to help you learn how to avoid doing so. Merely accessing the software doesn’t necessarily make one a presentation expert. We’ve all seen a presentation that was the pure embodiment of evil, spawned by a well-meaning presenter who just wanted to get the information out there, but didn’t know how to lay out or communicate it effectively. These presentations are like fallen angels. They could have been great! They could have inspired a room full of people to jump out of their chairs, declaring loudly, “Oh captain, my captain!” But because of a series of increasingly poor design decisions, they were relegated to the garbage bin of their audience’s collective memory. There is nothing less attractive to the eye than a jumble of bullet points crammed into a slide that the viewer is expected to absorb in a finite amount of time. Add in the fact that many first-time presenters use their slides as a script for the presentation, and you have a recipe for disaster. Even though it’s the same information, the audience is forced to take in two separate channels of information at once: one auditory and one textual. This forces the viewer to ignore one channel of information and stick to the other for info, which—since everyone reads at a different speed—creates a lag in information absorption when the presenter is expecting it to be in sync. One common rule of thumb is to keep your slides relatively clean, with no more than six words to a slide. It’s a presenter’s job to have the information down pat, able to give the presentation with minimal, if any, prompting from the slides themselves, so treat it more like a visual aid than a manuscript. If you have multiple bullet points to cover, split them up so they each have their own slide. An eye-catching picture can be a great prompt and visual aid for a PowerPoint presentation. But half measures avail us nothing. Don’t go cheap and use an ugly old piece of clip art. Get yourself some quality stock images, make some yourself, or find relevant images if you’re presenting on an actual event, person, or thing for which pictures exist. For instance, you might be doing a presentation on the 1980 eruption of Mt. St. Helens. In that case, don’t use a generic volcano drawing. Use the actual photographs that were taken of the event and make sure to discuss and contextualize the images with your audience. Don’t make same design decisions that your audience has seen a thousand times since they were in grade school. When an image or design “trick” gets that oversaturated, it doesn’t even register with the audience. It just becomes background noise that clutters the presentation and distracts from your overall message. Make an effort to be original and really brainstorm a unique way to explain your concepts. A big part of making a presentation land is developing a rapport with your audience. Certain anecdotes may play beautifully with one audience, but that’s no guarantee it will work for everyone. If you were giving a presentation meant for medical doctors (with all the vocabulary, in-jokes, and jargon that would entail) it might not go as smoothly for a group of mechanical engineers, or vice-versa). If you have time, make sure to do your homework on the culture and generalized personality attributes of the people you are presenting to, and tailor the presentation to help them connect with it. If you want a good shortcut, you can always ask for help as well. For expertly designed PowerPoint presentations, try out some of our PowerPoint games and graphics, and really spice things up with a little help from your friends at GetMyGraphics!